can you order the fries alone and have like a $0 order? Yes, ordered the free medium fries Raptors offer alone without credit credit in the app a few times already. Just got the big Mac / mc nuggets / McMuffin for 2$ promotion on my apps for Quebec !!! Yes, i've done it before when trying to use another coupon, I see countless people doing it too. This is actually a cold deal IMO. There's no way I am inputting credit card information into the McD app. In other words, this deal won't work for me as they force in-app purchase. Thanks but no thanks. You can still go for the $3 burger coupon, and that one they allow you to checkout with the kiosks, but this $2 big mac deal tries to bribe you to input CC info into their app for $1 extra savings. Yeah, no thanks. Year is 2019 and you are still paranoid about using a credit card? the free raptors fries is on today? No, they were only successful on 10 out of 32 attempts at 3 point shots last night. Nope. Only 10 made 3's last night. I think it isn't about using a cc, but about trusting some poorly designed app with your cc information. It's all about convenience. I assume you don't use Uber or mobile parking apps? Unable to successfully add my Mastercard and Amex into my account. Ah well, used the $3 instead. 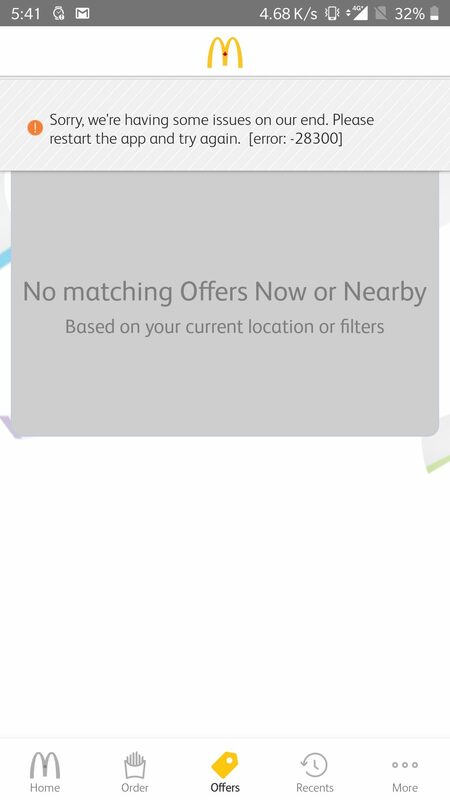 My app doesn't like to show offers when I'm at McD. I tried refreshing, closing the app, wifi, data, clearing cache, etc. No luck. It does work when I'm not close to a McD though.